Storage for your tuba mouthpiece in a leather boot with snap enclosure. Tuba Mouthpiece Boot in leather with snap closure. 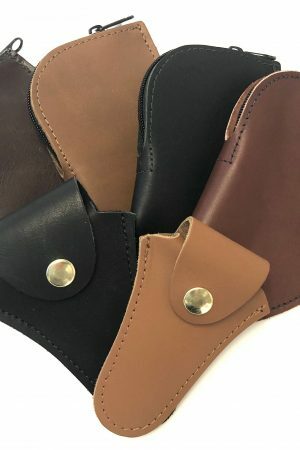 Storage for your trumpet mouthpiece in a leather boot with snap enclosure. This is the original Glenn Cronkhite-designed trombone travel slide case that dates back to the 1970s. Slides up to 32 inches will fit in the Standard Slide Case. If your slide is longer than that (up to 34.5 inches), make sure to select the Euro Slide Case. With a sturdy piece of wood on either side of the slide, you can be assured that it is well protected in a well made bag. Repair services are generally offered for older, pre-China Reunion Blues, San Francisco Glenn Chronkhite Gig Bags, and Minneapolis Glenn Cronkhite Gig Bags. This can be an extremely smart way to get another 5-10 years out of a leather bag. 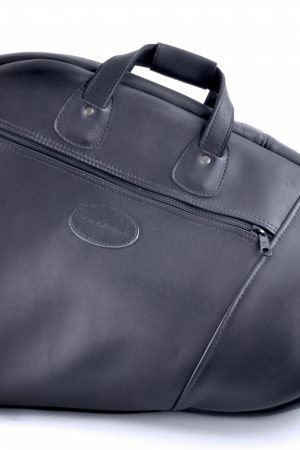 Storage for your trombone mouthpiece in a leather boot with zipper enclosure. This is a good item to add to any case or bag, and is a great spot to put your mouthpiece, pencils, and more. It is included with all of our large-sized bags, such as trombone, tuba, and harp bags. Measuring 8.5″ x 11.5″, this is a good item to add to any case or bag, and is a great spot to put your mouthpiece, pencils, and more. High end rubberized no-slip black nylon strap. Accessorized with leather trim and heavy duty steel snap hooks.